Today is THE Day! Truckload Sale Baby! MM TRUCKLOAD Sale Starts TOMORROW! 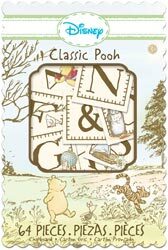 When it comes to babies, nothing is more timeless than Classic Pooh. It is perfect for baby boy OR baby girl! 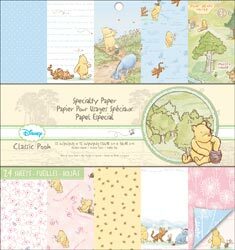 When EK Success recently released Classic Pooh, I knew I had to order it in! Here are some of the items you will find in store right now!! 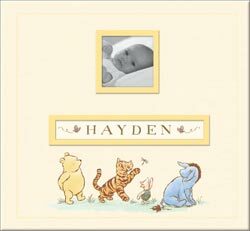 12x12 Post Bound Album - can be personalized with enclosed stickers! 12x12 Paper Pack with 24 sheets of decorative papers...some of the papers are glittered! Gorgeous glittery die-cuts with 66 pieces. Perfect for an album or so easy for a baby card! Glittery die-cut honey pots, bees and bee hives. Well, that was a wild week! 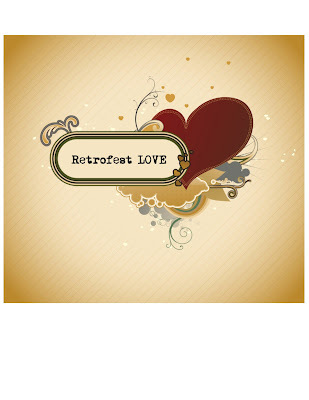 Thank you to all that came out to our truckload sale and to retrofest last week! I had a lot of fun and I know you did too!! 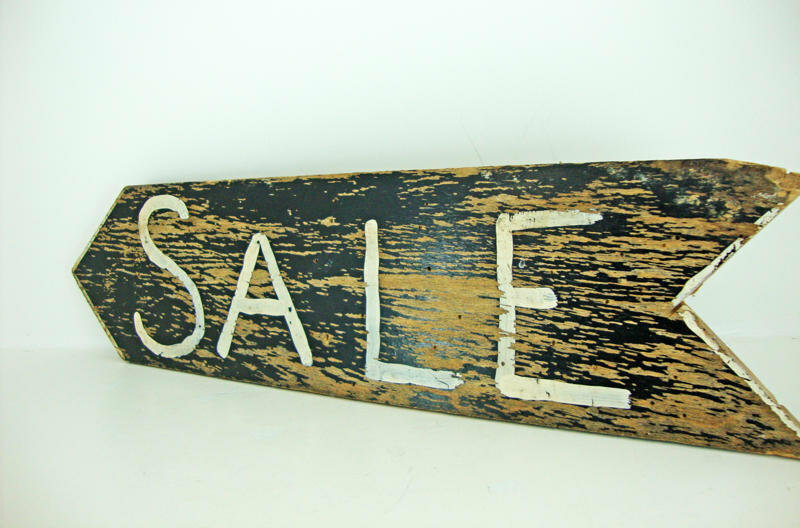 There are still many great items on the sales cart from our truckload sale last week. Stop in and see what you can find! And now the moment you have all been waiting for… Our card classes! This is at his and hers card class by the very talented, Pauline. Pauline will show you tricks to take your cards to the next level. 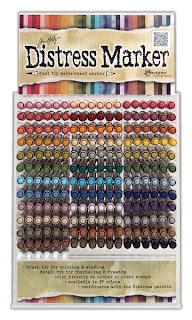 You will work with distress inks, punches, brads, embossing powders, decorative paper, twine and more. 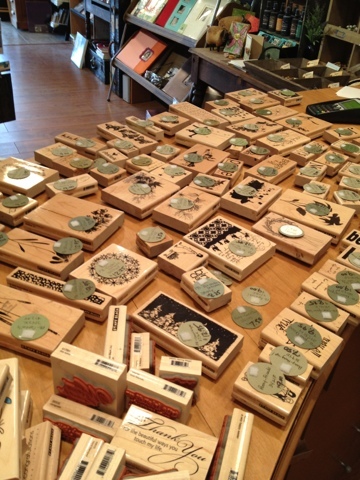 These cards are perfect for any occasion and for ANY level of stamper! I know many of you have trouble designing cards for various themes. You often come in here looking for ideas for wedding and baby cards. Well now you are in luck! 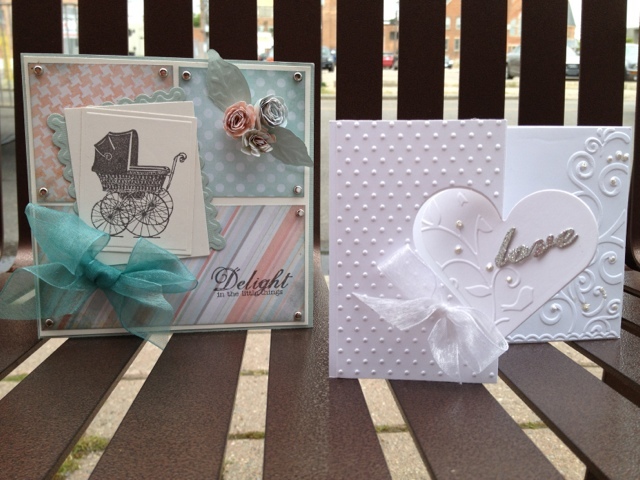 Debbie has designed two gorgeous themed cards perfect for those special moments and events in your life. 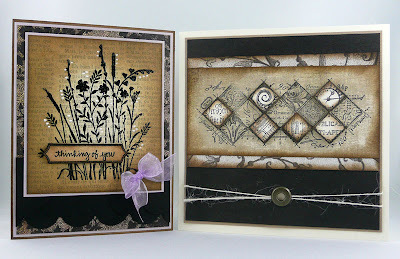 Debbie will also show you ways to add character to your cards by adding special folds and techniques. 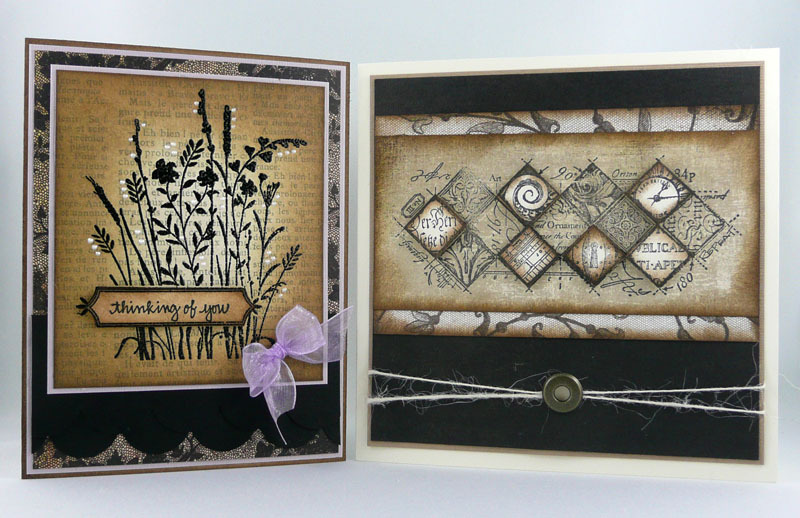 You will work with spellbinder dies to create gorgeous dimensional blooms. 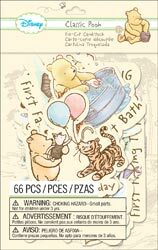 You will also work with embossing folders, unity stamps, brads, ribbon, distress inks, embellishments and more. Great class for all levels!! Please don't think that I have forgotten about you! I have and mini album in the works. Just working on adding lots and lots of technique to this class to make it worth your while! I will post in the next two weeks. Thank you for your patience. Give me a call at the store to sign up for these great classes! 519.351.5220. Grab a friend and enjoy a fun night out! Wow! What an amazing cruise last night! Seriously, if you have never been out to Retrofest, you ARE missing out! King Street was jam packed with people and the number of cars participating in the cruise was unreal!! We were going to count but instead spent the entire hour waving frantically at the people in the cars. If they waved, we (my 4 year old, 6 year old and me) let out an emphatic "YESSSSS". Oh, to act like a kid again.....love every moment of it! So yes, today the cars will be parked in the downtown. We have the Union Gas Kid Zone down 4th Street. We will also have a little make and take. I have kept it very simple because I know we will have TONS of kids wanting to participate. It is a cute tag though....when you come by, stop by for a little fun! Pssst.....here is a little sneaky secret for you.....if you mention you read my blog today and give me a little "Yessss" WITH the fist pump (ha!) I will give you an extra 25% off our truckload items!!! Shhhh....just our little secret for TODAY only. Wow....I sure am unusually perky for 8am!! Must be that Retrofest excitement. We have two great card classes coming up on June 6 & 12th at 6pm. $17 each. The cards are in the store but I have yet to get my photos. Pop in today so sign up and see the cards. 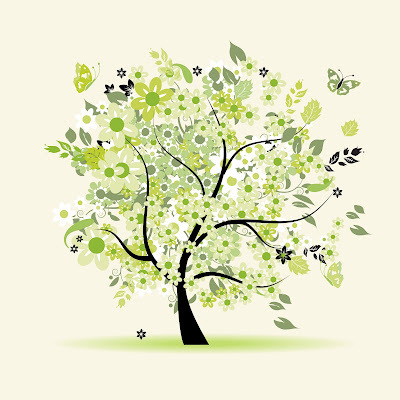 I will be posting the classes on the blog over the weekend. Sorry for the delay! 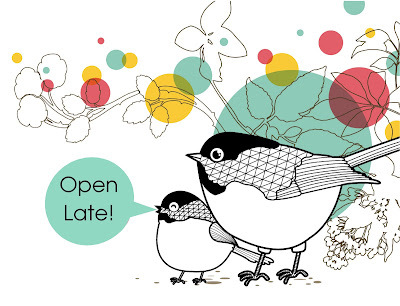 Open until 9PM tonight! The Fourth Street Market Opens tonight as well! Come and shop our amazing truckload sale. Tons of Making Memories items at 50-75% OFF. Also, save the tax on all regular priced items!! Just in case you haven't heard.....our 50-75% OFF Making Memories truckload extravaganza starts today at 10am! Sale will run all week but come early, k? Oh man! I am not sure if I could have packed any more fun and work into this long weekend! Work hard. Play hard. That was my family's motto this weekend and we sure lived by it. It is evident from the sound of snoring coming from all directions at this very moment! Ha. Don't tell my hubby I am sharing secrets! SO this is THE week you have all been waiting for....our MAKING MEMORIES TRUCKLOAD SALE! 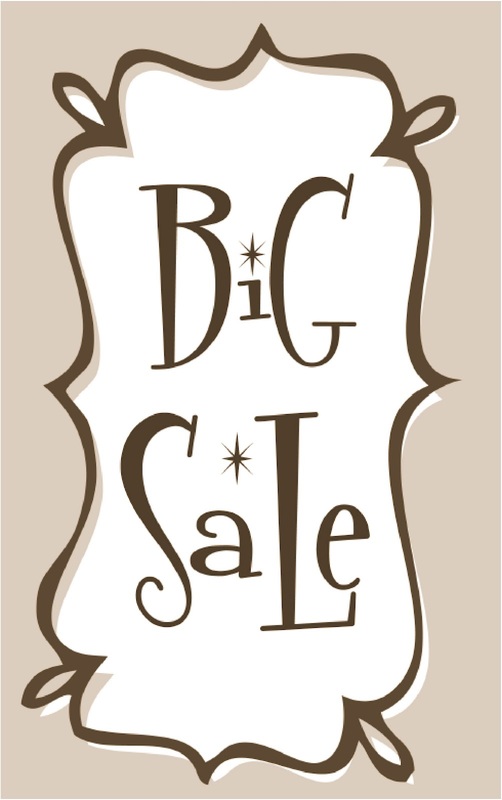 We have 100's of new product that you have never seen before ALL at 50-75% off retail! I am SO pumped! Sale will run all week and don't forget I will be open late Wednesday (10am-9pm) to celebrate the beginning of the Fourth Street Market. All regular priced items will be TAX FREE this week too! 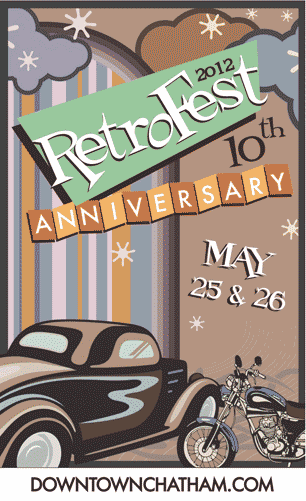 Retrofest will also be happening in downtown Chatham Friday and Saturday. Anyone who has not experienced this amazing event, MUST! Cool, classic cars....special pricing and promotions from the merchants.....fun events for the whole family. What more could you ask for?!? BIG Week Ahead - Don't Miss Out! Hey! Sorry for being a stranger lately but I have been prepping for a BIG week coming up! Oh my! You are going to be SO excited! Should I fill you in?!? Ok. Ok. So remember last year we had a HUGE Making Memories Truckload Sale? Well, I thought it would be fun to do that again! We will be open late Wednesday night to coincide with the start of the Fourth Street Market. The Market will run 5-9pm so hey, we may as well be open too! So we will in fact be open from 10am-9pm on Wednesday! Speaking of Retrofest, it is happening downtown Chatham on Friday and Saturday (May 25 & 26). It is my all time favourite weekend downtown. 1000's of classic cars line the downtown streets and the roads are just packed with people. This is their 10th Anniversary, so it is sure to be done right!! The kids stuff will be down our road (bouncy castle, inflatable slide, etc.). AND The Pickle will have a FREE make and take running all day Saturday. I am not sure if I will be designing a kids themed project or a craft for the "big" kids, but one thing is for sure....it will be done "pickle" style! So have I tempted you enough? 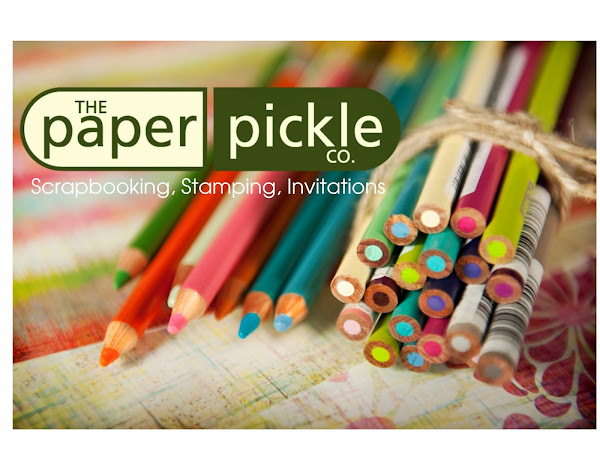 Next week is going to be THE week to visit The Paper Pickle! So get rested up this long weekend and I will see you Tuesday!! Enjoy the sunshine! Yes. You've read correctly. Two thoughts that are music to ANY stampers ears! So one day over the weekend, I went through our entire stamp wall and repriced all the Penny Black stamps to reflect their new lower pricing. You can see just how many stamps are now reflecting a MUCH lower price. 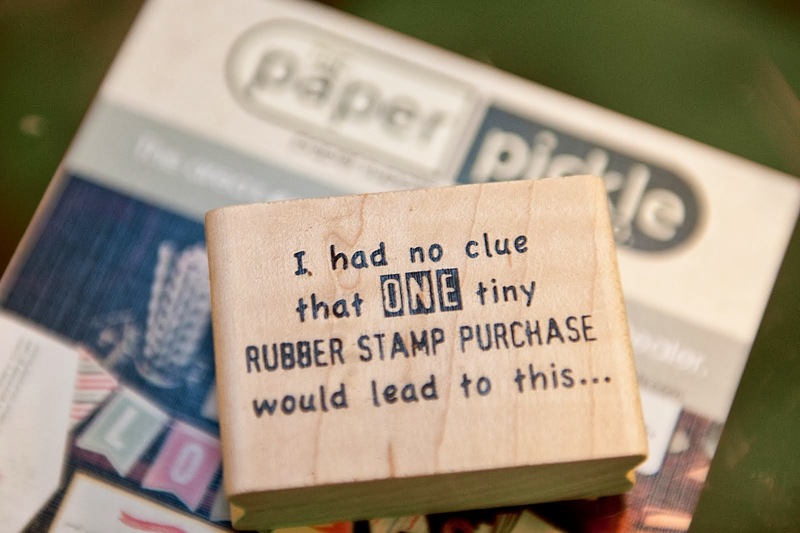 For example their largest stamps we over $17 and are now $12.95! That's huge! While I am on the topic of pricing, please know that I am dedicated to providing you with the most competitive pricing in Chatham Kent when it comes to paper crafting supplies and I hope you find our selection to your liking! If there is ever anything you are looking for and you do not see it in the store, just ask me if I can get it in! The Pickle is only one 1,200 square foot store and even with 10,000 square feet, I don't think there is any way you could carry everything that is out there! Don't be afraid to ask! Look out....here I go........So many of you have asked me what I think about the new big box craft store that has come to Chatham. Now honestly, I do think having a craft store here is amazing. It allows crafting to be more accessible to those in our community. How cool is that?!? I have thought long and hard about whether to post about this but I think it is my duty. I am keenly aware of the suggested retail prices when it comes to my product....that's my job. One would assume that big box = the lowest pricing and that is often not the case. For example, yesterdays flier showed Smashbooks on sale for $16.99 (regular $21.99 at the big box).....sale starts Saturday. Now I am not sure if you have noticed my everyday low price of $14.99? This is not special pricing on my part. This is in fact the suggested retail price set by K&Co. Many items are like that....hmmmmm....a little food for thought. I will leave it at that. NEW Ranger Distress Markers are HERE! I am so excited about these markers! Check out the video that Tim just did to show you all the cool things you can do with his markers! 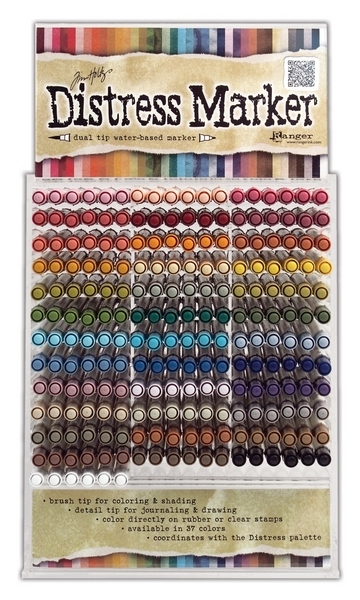 Priced at $3.50 each or you can get a whole set (37 colours with container) for $115.00...that like 4 markers FREE!